We strive to understand your lifestyle, how you plan to use each space and what meaningful items you want to integrate into your home. Why do we work this way? Many designers work in their own specific style and typically are hired based on that particular vibe. Our focus is to understand what your vision is for your home. We strive to understand your lifestyle, how you plan to use each space and what meaningful items you want to integrate into your home. We always say that we aren’t moving in to your home, therefore we want it to represent you and not us, of course with a Nest stamp on it. But don’t get us wrong, we would love to move into most of our clients homes! Designing your home is an emotional, personal process and our goal is to collaborate with you to create the best version of your home. How have we incorporated this into our clients homes? This particular client came to us wanting to design their nursery for their expecting baby boy. She had an amazing, old photograph of her aunt with an elephant that she wanted to use as inspiration for the vintage safari theme of the room. We chose to use this photograph as a jumping off point for textures, colors and vibe for the entire space. We used warm grays in the wainscoting and textural grasscloth to accentuate the colors stemming from the photograph. Another client reached out to us to design their living room and entry integrating many family pieces that were important to them. Our clients late father was a big horse rider and she held on to his riding saddle after he passed. 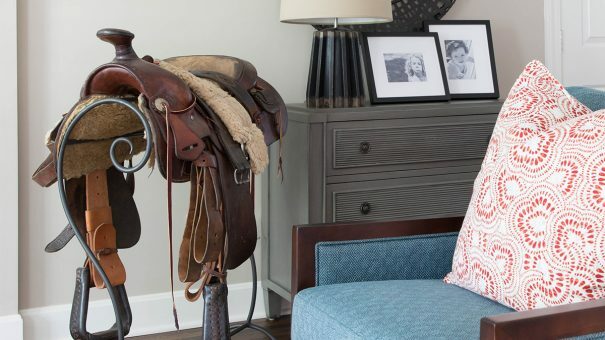 We were inspired by the saddle and chose to make it a sculptural feature in their living room. 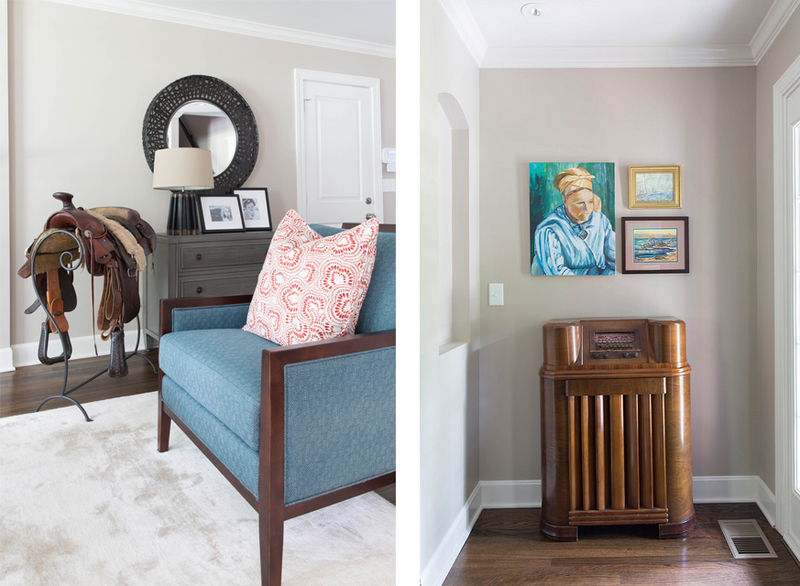 They also held on to a vintage radio that was a family heirloom and it fit perfectly in the entry niche accented with artwork our clients mother had painted hanging above. An important part of designing any space is how will you use that space. That also means, do you have kids or pets that will live in that space? We mean really LIVE and USE that space. We have kids and furry friends and understand what it’s like to have durable, quality materials and finishes in your home that your family can truly live with. 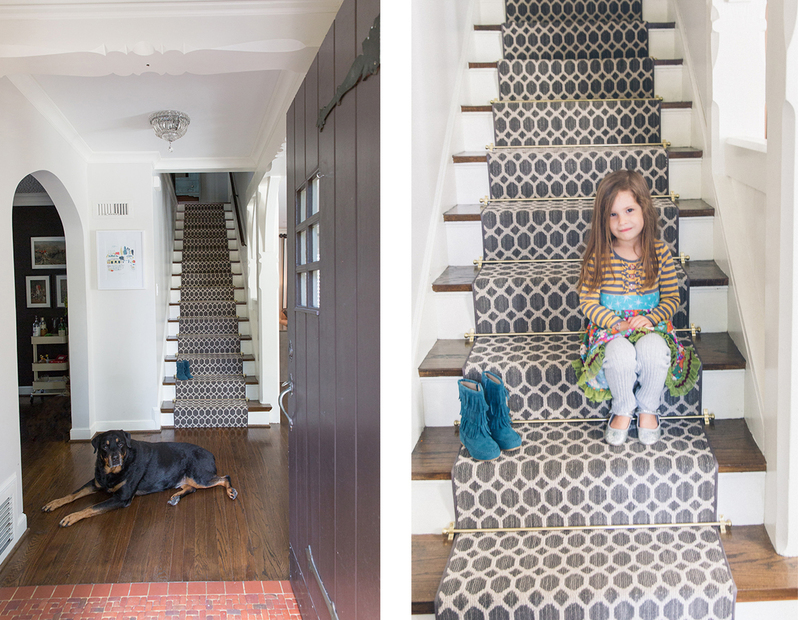 In this particular home, with 2 young girls and 1 large dog, we needed to specify a stair carpet that was not only low pile for traction and non slip for the kiddos but also durable enough for the puppy to go up and down on multiple times a day. Not to mention, selecting something with a fun, graphic pattern. For this guest bath, we knew this would be a bathroom that our clients’ young daughter would be using at times, as well as guests that would be staying over. We didn’t need a ton of storage so the idea of a floating vanity with a graphic, cement tile on the floor was the kicking off point for the space. 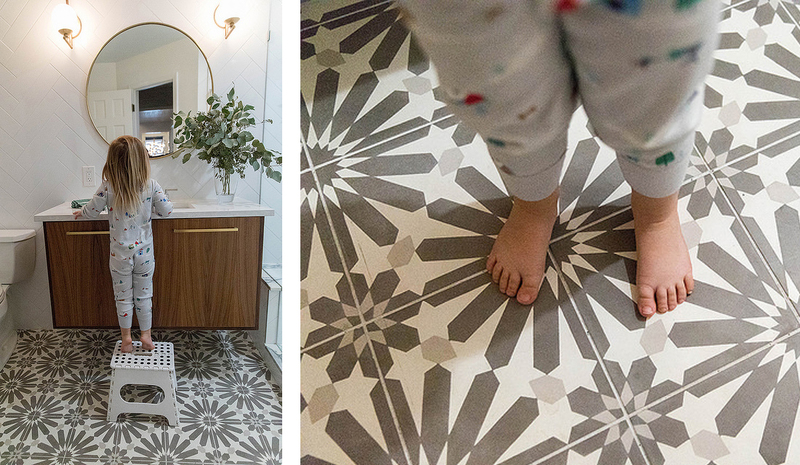 Mixed with a simple subway tile and brass accents, we created a fun, fresh vibe for this space that kids and adults alike can enjoy. And can we talk about how adorable this little kiddo is? When thinking about how best to tell your story in your home, we would start by making a list of important things that inspire you and would help drive your vibe. Katy’s love for bold color, family, graphic elements and vintage finds are what drives her vibe and tells her story. Kat’s story is driven by natural elements with calming colors, reminding her of the beloved outdoors mixed with sentimental finds and modern touches.